So it's been hot and humid here in Philadelphia. The weather people say we are in a heat wave, it feels more like a soup bath. Yesterday the temperature soared to 95 with the humidity it was over a 100. Even the flowers are wilting. But the heat was not going to ruin the holiday. We celebrated it with a few picnics. Had a pool party with friends over the weekend, though even the water felt more like a warm bath that's how hot it is. For the fourth we celebrated with family. 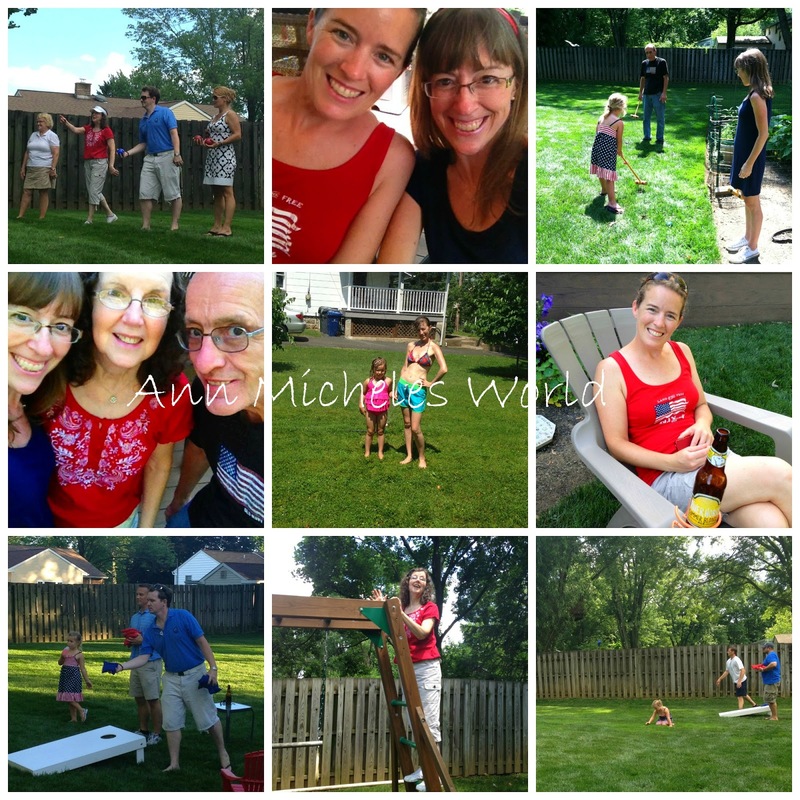 This year there were no kids except my niece as the others had plans but it turned our great as the adults got to play. Bocce, Croquet, Bean Bag Toss, you name it we played it. It was good, simple fun! And then what felt like icing on the cake we got to spend yesterday with the niece. So we played some more. When it comes to my niece there is no sitting back watching as she likes everyone to be involved in what she is doing. So we put on our bathing suits and spend the day running through the sprinkler with her. Honestly there is nothing like playing. All too often as adults we get caught up in the routines, stress and whatever else of life forgetting what it's like to just let go and play! Even my parents played, in fact my mother won a round of Bocce. And was spotted climbing the swing set. My sister's mother in law won a match of Bean Bag Toss beating even the men. The men played rounds and rounds of rather competitive Bean Bag toss until it got so dark they could no longer see the holes. Of course what would a picnic be without good food and there was plenty of that too. My thoughts this Monday....well growing old is a given, growing up is optional, playing is a necessity. 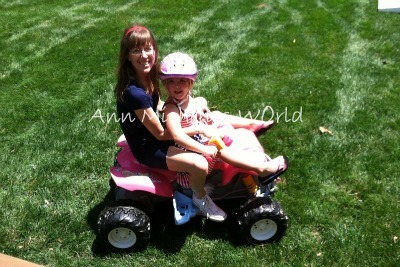 And being able to ride on a kids motorized bike priceless!